The past few months have seen a lot of stores and restaurants closing in the Pacific Beach business district. Local developers say a handful of things have combined to cause it. But the number of businesses in the area is actually climbing over the last couple of years. 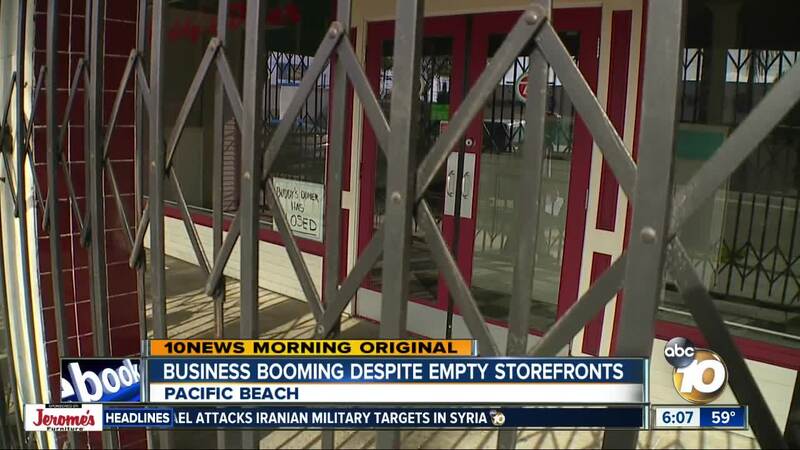 PACIFIC BEACH, Calif. (KGTV) - Business is booming in Pacific Beach, as the total number of business licenses is up from 2017. Still, empty storefronts and "For Rent" signs along Garnet Avenue have local leaders concerned. According to Discover PB, a local business advocacy group, the total number of licensed businesses at the end of 2018 was 1,521. That's up from 2017 when there were only 1,453. In 2016, the business district nearly set a record, with 1,557 businesses licensed. "The hospitality industry leads, and it follows," says Discover PB Director Sara Berns. "If restaurants are booming, other industries are booming." Despite the good numbers, people are concerned that too many small restaurants and businesses are closing. At the end of the month, Latin Chef, a Brazilian and Peruvian restaurant on Garnet will close after 13 years. The owner says a new landlord is forcing them out. "We were given 30 days to move out, that's what the law says," says Freddy Palma, the owner. "The new owner has his plans, and that's how it is." Part of the problem is property taxes. As the real estate market climbs, many long-time owners are selling buildings. Under Proposition 13, property taxes are only reassessed when a property is sold. That means many buildings are seeing dramatic jumps in the amount of taxes. Often that cost is passed along to tenants. "Anytime a new owner takes over, the taxes just skyrocket," says Realtor Cody Wippel. His company, Franco Realty, manages several properties along Garnet. "I don't think it's greedy. It's just the way it is with today's market and Proposition 13." Berns sees problems in leases as well, with many new places signing short-term contracts. She says landlords will often decide not to renew, or they'll raise the rent because it can be more viable to leave the space vacant and write it off for tax purposes. "I really try to educate (business owners) on really negotiating your lease and understand where you see your business in one year, five years, ten years," says Berns. "They have to think about what they can afford." For Palma, he says he hopes to find another location and that his clientele will follow him. "We're confident about what we are making," he says. "So, we'll keep going."